So says Travis Glasgow, the protagonist of Floating Staircase, Ronald Malfi’s 10th novel. And above all else, this novel is authentically honest writing. The characters are fully fleshed-out, the dialogue is realistic, and the plot, though speculative in nature, is psychologically plausible. And it’s good, too, the kind of work that gives horror a good name. Above all else, Mr. Malfi is a skillful storyteller; his prose doesn’t get in the way of his storytelling, his ability to keep the reader hooked from one page to the next. And he doesn’t do so by resorting to mindless gore-fest tactics as some other mainstream horror writers do. He writes. That’s what he does. That this is a supernatural tale is almost a biproduct. In this respect, Floating Staircase deserves to stand alongside a Stephen King or a Dean Koontz—at their best. 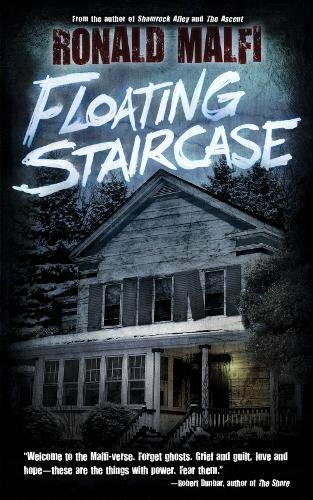 Floating Staircase is a mature horror yarn, but, deep down, it is also an exploration of obsessions, and in particular the obsession it takes to be a writer. Travis Glasgow is a writer himself, and the story flows from his character, his flaws, his unique personality traits. The trigger for the narrative is Travis’s move back across the Atlantic from North London to Maryland following the success of his latest novel. The move allows him to renew his relationship with his elder brother, Adam, who also lives in Westlake, and also offers him the opportunity to finally come to terms with the loss of his other brother, Kyle, who drowned when he was just 13. It soon becomes clear that Kyle’s death has haunted Travis’s every move, has followed him across oceans, across continents, even. The death, and the fact that Travis blames himself for it informs, either consciously or unconsciously, his every act, his every relationship. It’s the darkness that stops him from wanting to become a parent with his wife, Jodie, and it’s the one strand of narrative—a drowned boy—which all of his bestselling books have in common. The intertextuality here, the way Mr. Malfi writes about a writer who starts to write his own version of Floating Staircase, is very interesting. Stephen King’s best work features writers as protagonists (The Shining and Misery are just two examples), and it’s clear that it’s in the nature of an author’s job to be an obsessive. But the length of this text invites an obsessiveness on the part of the reader as well. Readers like to be given challenges. There is something comforting about being consumed by a book, as much as you consume the book. It implies something of the epic, neverending stories of our youth. And there is a yearning in horror fiction in particular to return to a childish way of seeing things. Speculating on the unknowns that might exist within the margins of the black and white world. It’s escapist sure, but when done well, like Mr. Malfi’s work is, then it works perfectly. Some lengthy books betray self-indulgence on the part of their authors. Although Floating Staircase weighs in at 464 pages, it is definitely not self-indulgence. This is a meaty book in which to luxuriate. A little self-indulgence of my own here: My Nana used to call all such thick books “tramscotchers.” This is a particular phrase to the North West of England, and it referrs to the thick muffling devices that are used to slow down the trams in the towns. Floating Staircase is a tramscotcher of a book, but not because it is so thick, rather because it stops traffic. Here is a novel that truly deserves to cross genre boundaries and be valued for what it is: an excellent, highly addictive read. To conclude, a quick note on the staircase itself, which is perhaps the other most intriguing aspect of the novel. The image of the floating staircase itself is a memorable one. It recalls the Dutch artist M. C. Escher, whose most recognizable, striking works are representations and ruminations on the nature of infinity—in particular his floating, interlinked, impossible staircases. As an image that reverberates throughout the text, this is particularly informative. Grief and guilt are impenetrable mazes through which it is almost impossible to navigate a way out of. Such single-minded obsessions as evidenced by Travis are impossible constructions.